Suzanne Bessenger leads a discussion during one of her religious studies courses at Randolph. 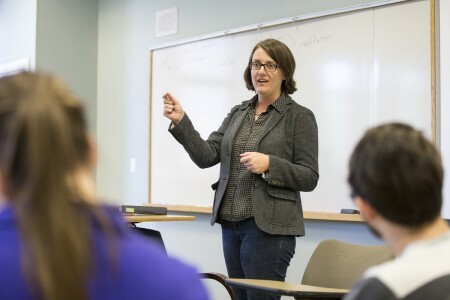 Suzanne Bessenger has been selected from a competitive, national pool of nominees to participate in a faculty seminar on the teaching of interfaith understanding. The seminar is offered by the Council of Independent Colleges (CIC) and Interfaith Youth Core (IFYC), with support from the Henry Luce Foundation. Bessenger, a religious studies professor at Randolph, and 25 other faculty members will participate in the five-day Teaching Interfaith Understanding seminar July 31–Aug. 4 at DePaul University in Chicago, Ill. The seminar will be led by two leading scholars: Eboo Patel, founder and president of IFYC, a Chicago-based organization building the interfaith movement on college campuses; and Laurie Patton, president of Middlebury College, former dean of Trinity College of Arts and Sciences, and the Robert F. Durden Professor of Religion at Duke University. The program aims to broaden faculty members’ knowledge and strengthen their teaching of interfaith understanding, with the development of new courses and resources. As part of her application, Bessenger was required to write an essay about her approaches to teaching religious pluralism and how Randolph might benefit from a professor pursuing the subject in an in-depth manner. At Randolph, Bessenger and her students explore the definition of religion and how it has shaped human history and their daily lives. For more information about the seminar, visit www.cic.edu/TeachingInterfaith.